Diastema is a gap between two teeth. It is usually located between the upper central incisors, but it can be located between any two teeth in the mouth. When it comes to diastema closure there are different treatment options. One of them is orthodontic treatment, but patients do not really like this option because it takes a long time to get the wanted results. Another option is direct or indirect composite restoration. This requires a very skilled dentist, and the patients get the results after the first visit. Porcelain veneers can also be used to provide great aesthetic moment. 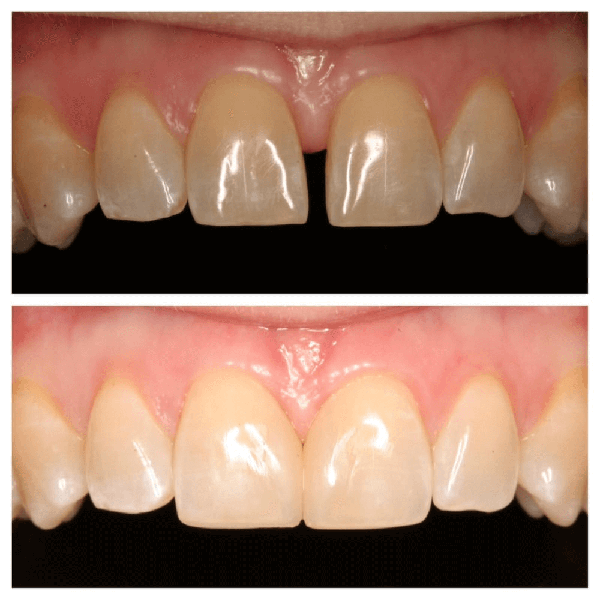 Dental crowns and bridges can also be an option for diastema closure. There are several factors that can cause the appearance of diastema or a gap between two teeth. The first one is genetics. We inherit the size of the jaws from one parent and the size of the teeth from the other one. Some people simply inherit large jaws with small teeth, which results with spacing. It can appear anywhere in the mouth. Diastema is a hereditary thing, so if one of your parents had it, the chances are that you might also have it. Some people can be born with atypical teeth, for example very small lateral incisors. That can also lead to gaps. The second common reason is the extraction of a tooth. Once a tooth is removed, it leaves an empty gap. Other teeth tend to move towards the empty space which results in a spacing between the teeth. That is why every removed tooth should be treated with a proper restoration in time and the gap should be closed to avoid migration of surrounding teeth. Periodontal disease is another factor that can lead to diastema. Because of this condition, teeth can become loose and migrate. People often lose a number of teeth in their mouth which creates spaces and makes things even worse. Unfortunately, the periodontal disease appears very common among people, and these diastemas are very hard to treat. This is surgically treated with a very simple and easy procedure. Bad habits such as thumb sucking or tongue thrusting can often cause diastemas. That is why they should be treated immediately, and kids should wear functional appliances to fix the problem. The treatment mainly depends on the reason that caused the gap. If it is purely aesthetic, then it can be treated with cosmetic dentistry. For example, composite restorations are one way to go. They can look very natural especially if done by a skilled dentist. Composite is a very affordable alternative and it can look amazing. Orthodontic therapy is always advised, but since it takes quite a while most people decide to do restorations. If the gaps appear at an early age, that is when orthodontics is very useful. Another way to go is veneers. They are also a great alternative but can be more expensive. The same thing applies to crowns and bridges. If there is a certain reason, such as periodontal disease, a bad habit, missing teeth, they should all be treated properly.